The AEM 28-20385 fits some Ford Expedition, Ford F150, Ford F150 Platinum, Ford F150 Raptor, Ford F150 SVT Raptor, Ford F250 Super Duty, Ford F350, Ford F350 Super Duty, Ford F450 Super Duty, Ford F550 Super Duty, Ford F650, and Lincoln Navigator models. See vehicle applications for details. Looks very good and shipment came quickly. 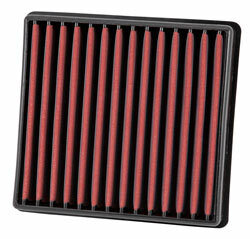 I like the idea of oil free air filter. Purchased this for my wife's 08 Ford Expedition. I haven't noticed any changes yet but being able to wash this instead of replacing it will be very helpful. Install was just as easy as putting a disposable one in. I have the cold air intake for my Diesel and I swear by it. It only made sense to get this for her Expedition. Perfect fit and very good quality airfilter.